Turkey has come a long way from needing an International Monetary Fund (IMF) loan or related technical assistance, President Recep Tayyip Erdoğan said yesterday. "Turkey's economic indicators are at a very good level compared to other countries," Erdoğan said in his concluding speech at the Justice and Development Party (AK Party)'s 27th Consultation and Assessment Meeting in Ankara's Kızılcahamam district yesterday, adding that Turkey has closed the IMF chapter for good. The president slammed the remarks from the main opposition Republican People's Party (CHP) after it was announced that Turkey will receive consultancy services from the international consultancy firm McKinsey. In his weekly address to party lawmakers last week, CHP leader Kemal Kılıçdaroğlu said that according to the government, McKinsey should provide consultancy to Turkey every three months, because the government does not have confidence in the Turkish state. In an apparent reply to these comments, Erdoğan said: "We undertook a debt of $23.5 billion when we came to the office. We paid off the debt in 2013. Aren't we the ones who saved this country from the IMF yoke?" "For your information, Mr. Kemal, the first standby agreement with the IMF and the following four agreements were signed by the head of the coup regime Cemal Gürsel and the former president of the CHP İsmet İnönü," he added. Gürsel, a former commander of the Turkish Armed Forces and the fourth president of Turkey, was the head of a coup regime in 1960 when a group of 37 relatively low-ranking officers instigated a military coup to topple the Democrat Party (DP) government, which had been in power since 1950. They accused the government, led by Adnan Menderes, of leading Turkey to a regime of oppression and down a path of political turmoil. The 1960 military coup resulted in the execution of Menderes, Turkey's first democratically-elected prime minister, and two of his colleagues. It is still remembered as one of the darkest days in the Turkish Republic's history. İsmet İnönü, a Turkish general and statesman, who served as the second president of Turkey from 1938 to 1950, became the permanent chairman of the CHP upon the death of the founder of the Republic of Turkey Mustafa Kemal Atatürk in 1938. "The history of CHP, which brought the evil of IMF to our country, is full of grave political and economic records," he noted. Erdoğan stressed that both the public and private sectors have put up a historic fight against any attack on Turkey's economic independence. 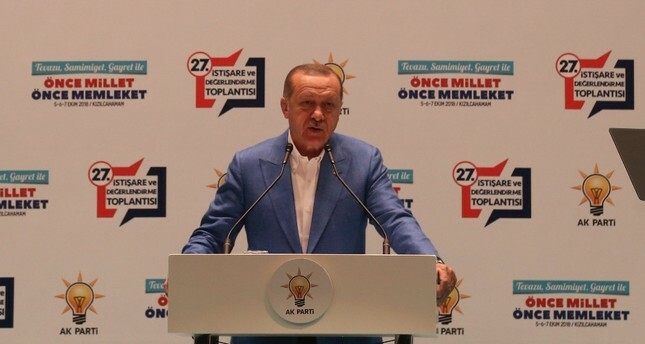 During his speech on Saturday, President Erdoğan said that as long as he is alive, no international organization will be able to "put Turkey under the yoke." He also said he had ordered his ministers not to receive any financial advice or consulting from U.S. firm McKinsey, saying the government would rely on domestic capabilities instead. He assured investors and the public that there was no economic crisis in Turkey and the sudden rise in exchange rates were only manipulative moves, saying that the country will follow its own programs and come up with its own solutions to reach its goals. Erdoğan said that Turkey had recovered greatly from one the largest economic attacks in Turkish history and had put a stop to the fluctuation in exchange rates in just under two months. He stated that Turkey underwent major reforms and radical changes in a short period to tackle difficulties. "To overcome [economic] hardship we have implemented and undergone major reforms and radical changes swiftly, that in normal circumstances would have taken years," he said. Underlining that it was not possible to explain this sudden and sharp increase in exchange rates within the economic context, Erdoğan said Turkey was not avoiding taking responsibility but only assessing the situation. Regarding 'opportunists' making astronomical price hikes using forex (foreign exchange) rates to their advantage, President Erdoğan warned that necessary fines would be imposed on them within free market rules. "We will not abandon our people to the mercy of opportunists," he said. Erdoğan had urged Turks on Tuesday to report stores that had imposed unusual price hikes following fluctuations in rates. "Turkey is open to all sorts of investments, support and contribution as long as the price to pay is not sovereignty or the future of country," the president added. He noted that Turkey asked for investments during official visits to foreign countries, but never for money. The interest of international investors in Turkey continues, the president added, stating that good news is expected to be announced in the upcoming period without giving further details. Erdoğan added that Turkey is among the countries with the lowest public debt to national income ratio.